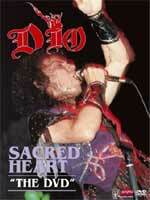 The first time I saw Dio was during the ‘Sacred Heart’ tour this DVD – which actually is a re-issue of a home video released on VHS in like ’87 —documents. It was the first week of my junior year of college and I blew off class to drive four hours from Hartford, Conn., to Burlington, Vt., to meet up with some friends, and then schlep with them two more hours up to Montreal, where Dio was playing at the old Forum. Then, I turned around the next day and drove back to Connecticut. But between the higher-octane Canadian beer and the spectacle Dio put on the Forum, the 12 hours of driving for a 90-minute concert (not counting god awful poser openers Rough Cutt) was totally worth it. A DVD can only begin to capture just how huge a production the Sacred Heart show was. This was Dio at the height of their popularity, playing to a full house at Philadelphia’s 18,000-seat Spectrum — I saw them at their lowest point years later, playing at a dingy club outside D.C. during the ‘Angry Machines’ tour, when, I must confess, I only went because I was interviewing openers My Dying Bride —and band leader Ronnie James Dio unleashed everything in his arsenal to make sure the show blow everyone’s mind. Banks and banks of lights on mobile rigs, holograms, lasers, pyro, a mammoth stage set straight out of King Arthur’s Court, Vinnie Appice’s wrap-around drum kit, dueling robot knights and the piece de resistance — a 20-foot-high, laser firing, fire-breathing dragon. My jaw was on the Forum floor for the whole show. Nothing I’ve seen since — except maybe for Metallica’s ‘And Justice For All’ show — has come close in terms of sheer special effects skull fuckery. “We wanted it to be overwhelming,” Dio notes during the DVD’s brief interview segment. And believe me, it was. It still looks pretty incredible 17 years later, even if the technology seems a bit clunky now in this age of Lord of The Rings computer magic. With all this stuff going on, the music almost becomes secondary. And, indeed, at 60 minutes, the DVD presents only about two-thirds of the compete ‘Sacred Heart’ show —some songs I remember from the set that didn’t make the cut here are “We Rock,” “Stand Up And Shout,” the magnificent “Don’t Talk To Strangers” and a Sabbath song I think might have been “Children of the Sea.” Indeed don’t expect much in the way of DVD “extras” either because, save for like 20 minutes worth of interviews, there ain’t any. But what the DVD lacks in quantity, it makes up for in sheer ‘80s metal grandiosity — although, thankfully, the guitar and drum solos also got ended up on the cutting room floor. Despite having just hired on guitarist Craig Goldy, the band — with Dio, the classic rhythm section of Appice and bassist Jimmy Bain, and keyboardist Claude Schnell —is spot on, charging through “King of Rock And Roll,” a medley of “Last In Line” and “Holy Diver” as well as “Long Live Rock ‘N’ Roll” and “Man On A Silver Mountain” sandwiched by “Rock ‘N’ Roll Children” with flash, aplomb and “devil horns” aplenty. Oh yeah, and “Rainbow in the Dark.” Duh! Sacred Heart is where most of the action happens, as the song is transformed into a piece of epic theater with the dueling knights and the dragon and crystal balls and Dio running around amidst it all swinging his own laser sword and, ultimately, slaying the dragon. Sure it’s cheesy as hell, but it’s also a lot of fun to watch. This is one trip down memory lane that certainly is worth taking, even if it’s a bit of a chintzy one.